The Gadget: It's the most simple phone I've used in ages. It calls, has an archaic UI, no frills, and a 1.3MB camera: Bleh! But it's the most rugged outdoor cellphone I've ever seen. It's tough, maybe tougher than it needs to be, considering that there are other limitations to its usefulness as an outdoor tool, namely battery life, which was standard. I don't know when I'd take this phone out where it would take the abuse it can take, daily, in exchange for its 2003 feature set. If you're using this as an outdoor athlete, you probably don't need this phone. 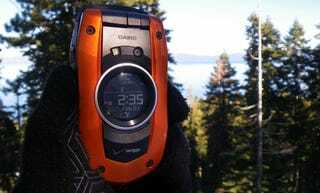 If you work on ski patrol, or as a ranger, sure, this phone makes sense. As does it for a professional sailor, police officer, etc. Rather than being a great outdoors tool for recreational use, even serious recreational use, I'd say it makes more sense for those who will face challenging conditions, yet be close enough to civilization to charge up and always have reception. Me, when I'm in the city, I don't go outside. And when I'm outdoors, I hate fiddling with most gadgets. I'll just lock a smartphone in the car or leave it stashed in my bag in a ziplock, or something. But that's just me. This phone is impressive and worth a look if you spend your working day damp. * The Water Resistance test was performed in accordance with Method 506.4, Procedure I. The G'zOne Type-S was subjected to this test with the handset open and closed, but with ports closed for 30 minutes on the front of the unit and then 30 minutes on the back of the unit. The test was designed to simulate rainfall of 2 inches per hour with a 40 MPH wind. Result: The G'zOne Type-S showed no visible evidence of damage or deterioration caused by testing. * The Humidity test was performed in accordance with Method 507.4. The G'zOne Type-S tested for operation after the conclusion of the tenth cycle. Each cycle was 24 hours and the entire test was performed over ten days. The temperature was cycled between 86 and 140°F with the relative humidity at 95 percent constant. * The Drop test was performed in accordance with Method 516.5, Procedure IV. The G'zOne Type-S was sequentially dropped in non-operating mode, onto each face, edge and corner for a total of 26 drops from a height of 1.50 meters (4.9 feet). The drop surface was defined as two-inch-thick plywood over a steel plate over concrete. Result: The G'zOne Type-S powered on. * The Dust Resistance test was performed in accordance with Method 510.4, Procedure I. A temperature of 95°F was used for this test. Silica flour as defined by the test standard was used. Devices are given a passing grade when moving parts are not bound or blocked and if the unit powers on. Result: The G'zOne Type-S showed no visible evidence of damage or deterioration. * The Immersion test was conducted in accordance with Method 512.4, Procedure 1, with the handset immersed in water for a period of 30 minutes at a depth of 1 meter with ports closed. Result: The G'zOne successfully powered on with no visible evidence of damage or deterioration.